I tried in vain to keep separate blogs for the adult/teen books I read and the children’s books I read. You know that saying, “starting a new chapter in life”? Well, having a child isn’t starting a new chapter. Its an entirely different book, in a different genre, quite possibly by a different author. This is all to say, that I’ll somehow be figuring out how to merge these two elements of my life into this blog. As much as I’d like to keep my mom-self separate from my adult-self, its not something I care to invest too much time into. Besides, kids books are usually way more fun than adult books. Being the avid reader that I am, it feels only natural to read to my child. We read to him almost every night, immediately after bath-time. This is the foundation for some fun shelf-searching at the library for library books. Its also incentive to enter into giveaways for children’s books. A couple weeks ago I entered a giveaway hosted by Reading Rockets.org and actually won! I won 6 wonderful picture books for my little bookworm, Arthur. 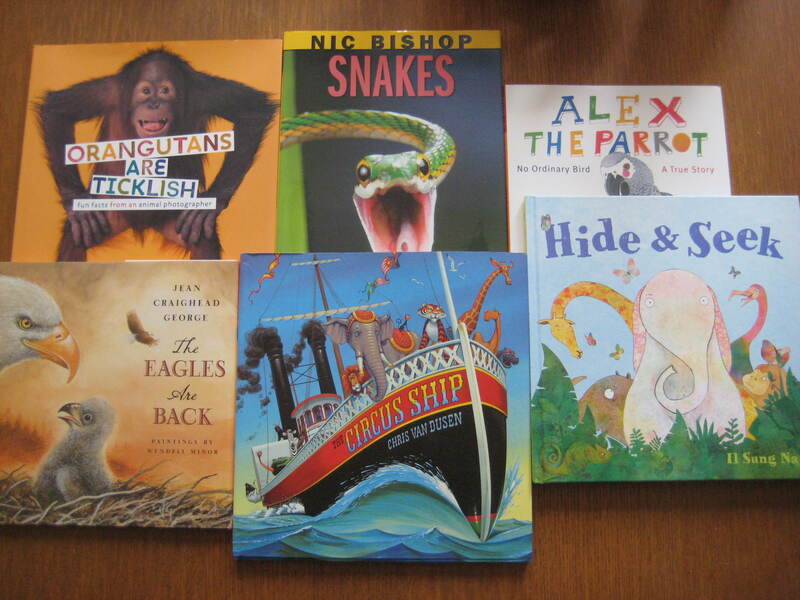 The package also came the following books: Hide & Seek by Il Sung Na, The Eagles Are Back by Jean Craighead George, The Circus Ship by Chris Van Dusen, Orangutans are Ticklish by Steve Grubman, Alex the Parrot: no Ordinary Bird by Sephanie Spinner, & Snakes by Nic Bishop. with some great booklets on themed reading; gardening and flight. Reading Rockets is a fantastic organization that I just recently discovered. We bring the best research-based strategies to teachers, parents, administrators, librarians, childcare providers, and anyone else involved in helping a young child become a strong, confident reader. Our goal is to bring the reading research to life — to spread the word about reading instruction and to present “what works” in a way that parents and educators can understand and use. Now that my own little bookworm is about to hit the 4 month marker, (4 months already! ), I’ve seen his interest in books grow exponentially. Since day 1, I’ve been reading to him. Whether its the Steinbeck book I’m reading, or picture books and board books I check out from the library. Over the course of the past 4 months, I’ve seen his interest grow and his attention span just mystifies me. He can pay attention as we read some really long books (ie. Bear Feels Sick by Karma Wilson). At first, he would just stare at the reader rather than the book, but now his gaze drifts towards the book and the illustrations. This is part of the reason why I am so excited to have won these books. Although some of these authors are new to me, Il Sung Na is one of my favorite children’s book authors and illustrators. His visuals are amazingly colorful, full of texture and dimension. Same goes with Chris Van Dusen. All of the books are visually appealing and all are informative and fun.